The Indian Air Force (IAF), struggling to maintain its operational capabilities with an ageing and depleting strength of combat aircraft, will see its fighter squadrons rising from the current 32 to 42 by 2022, parliament was informed Wednesday. "With the planned induction of Su-30, Jaguar, medium multi-role combat aircraft (MMRCA), fifth generation fighter aircraft (FGFA) and the light combat aircraft (LCA) during 2007-22, the strength at the end of the 11th, 12th and 13th plan periods is expected to increase to 35.5, 35 and 42 squadrons respectively," Defence Minister A.K. Antony said in a written reply in the Rajya Sabha. "In addition, steps have been taken to upgrade the existing MiG-21, MiG-27, MiG-29, Jaguar and Mirage-2000 aircraft," he added. 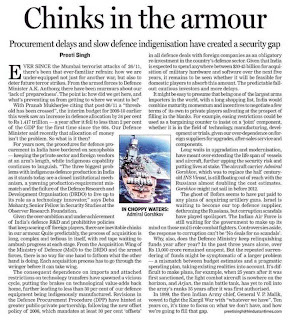 This apart, the induction of force multipliers like airborne warning and control systems (AWACS) and midair refuellers, together with advanced weapons systems "will greatly enhance the combat capability of the Indian Air Force," Antony pointed out. The IAF is set to begin field trials of the six combat jets in the running for its MMRCA order for 126 fighters, with the number likely to go up to 200. The field trials are expected to last 18 months as the aircraft have to be tested in different environments like the deserts of Rajasthan, the icy heights of Leh in Jammu and Kashmir and the humid conditions of south India. The Boeing F/A-18 Super Hornet, the Lockheed Martin F-16IN Super Viper, the Dassault Rafale, the Eurofighter Typhoon, the Saab Gripen and the MiG-35 are the six aircraft in the fray. As for the indigenous Tejas LCA, after prolonged cost and time overruns, series production of two squadrons has begun and the IAF is expect to induct the first aircraft from 2012. While the IAF has ordered 124 aircraft, it is known to be unhappy with its performance with its existing engine and is not likely to order any more. Ironically, the delays in the LCA programme had prompted it to embark on the MMRCA hunt. India has ruled out strikes on Pakistan saying the war option is not on the table. In a clear reference to America's strikes on Pakistan's border with Afghanistan in recent days External Affairs Minister Pranab Mukherjee said, "Some countries may be exercising the military option but that India would not do so." 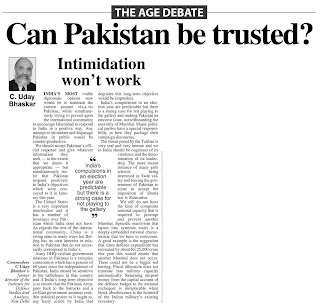 Meanwhile, India is viewing the Pakistan's peace deal with Taliban with much concern. While some reports in Pakistan say that the deal could be a tactical retreat by Islamabad, New Delhi sees it as a military surrender to the Taliban, something that confirms its fears of the Pakistan Army's inability to check the growing influence of Taliban. 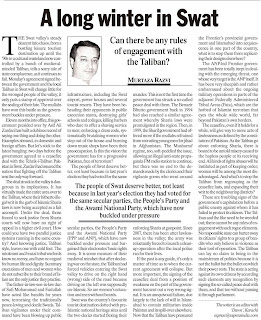 There is also a feeling in New Delhi that the Taliban still enjoys the support of large sections of the Pakisan army. Arrested Army officer Prasad Purohit had allegedly obtained the explosives used in the 2008 Malegaon blasts and supplied them to two other accused, Rakesh Dhawade, another accused, has said in his confession. "In August 2008 Purohit told me that two persons associated with Sadhvi Pragya, Ramji Kalsangra and Sandeep Dange, had asked him for RDX. He said RDX has to be given to them at all costs," Dhawade said in the confession given to the police in December 2008. Dhawade said he refused to assist Purohit in obtaining the explosives, but after a few days the Lt Colonel telephoned him and told him that he had obtained the RDX. "Using that RDX, Pragya's associates carried out the blast in Malegaon." However, when produced before a Magistrate later, Dhawade denied making such statements and said his signature had been taken on previously typed sheets of paper. He also denied any involvement in the September 29 Malegaon blasts in which six persons were killed. Dhawade said he had met Purohit at a shop in Pune in 2005 and many times at his residence. In his statement, Dhawade has also alleged that the right wing organisation, Abhinav Bharat, had been formed by noted historian Ninad Bedekar and Shirish Date, an associate of Purohit and himself. 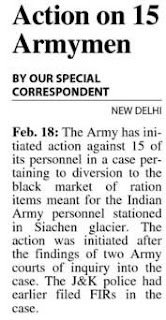 New Delhi, Feb. 18: The Indian Army finds an “awkward” situation arising after the government this year conferred as many as 11 Ashok Chakras, the highest peacetime gallantry awards most of them to policemen who were killed. Unable to articulate its dissent in public, the army has expressed its protest by posting on its website the criterion for conferring the medal which, it says, is not meant for members of the regular police services. In reality, officers in Army Headquarters here say in private that they find the decision to award the Ashok Chakra to Hemant Karkare, Vijay Salaskar and Ashok Kamte of the Maharashtra police and Mohan Chand Sharma of Delhi police dubious because their actions do not fit the definition of “conspicuous gallantry beyond the call of duty”. The four policemen died in the course of their duties, the first three in the terror attacks in Mumbai and Sharma in the encounter at Batla House in Delhi’s Jamia Nagar. Former army officers are voicing dissent. “The Ashok Chakra has an aura and a dignity only because it is given rarely. It will lose that dignity if it is given away commonly. Second, these awards are for gallantry and not for dying. “My condolences to the families and it is true that they have died in action but unfortunately I do not think they are deserving of gallantry,” says former deputy chief of army staff, Lieutenant General (retired) Raj Kadyan. Kadyan says maybe the army is itself to blame because it recommended the Kirti Chakra, also a gallantry award a notch lower than the Ashok Chakra, to Brigadier R.D. Mehta, India’s defence attache who was blown up when a terrorist drove a bomb-laden truck into the embassy in Kabul. There are also insinuations that political expediency shaped the decision on the Ashok Chakras for Sharma and Karkare. The BJP had demanded the medal for Sharma who led the raid against the alleged Indian Mujahideen suspects in Batla House where he took bullets and died hours later. Karkare, of Maharashtra police’s anti-terror squad, was leading the probe into the Malegaon blasts in which an army officer is an accused. Since the Ashok Chakra — its wartime equivalent is the Param Vir Chakra awarded for gallantry in the face of the enemy — was instituted, only about 40 have been granted. 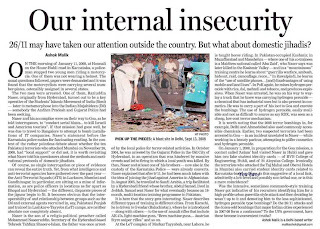 The highest given in a single year was three in 2002 to security personnel involved in defending Parliament against the attack on December 13, 2001. But on January 26 this year, 11 Ashok Chakras were given by the President, and the Republic Day parade was cut short to make time for the award-giving ceremony. The Ashok Chakra is the only gallantry award given on Republic Day. Six of the 11 awardees were for security personnel in 26/11 — all posthumous: Major Sandeep Unnikrishnan and Havildar Gajendra Singh (from the NSG), and Karkare, Kamte, Salaskar and Tukaram Omble from the Mumbai police. The other awardees were inspector Sharma, Havildar Bahadur Dohra, Colonel Jojan Thomas, Orissa Special Operations Group assistant commandant Pramod Satpathy and Meghalaya’s DSP Raymond P. Diengdoh. Former Vice-Chief of Army Staff Lt General Vijay Oberoi, who lost a leg in the 1965 war with Pakistan, says in an article titled Death is humbling but not synonymous with bravery that “by all accounts, all four police officers were highly efficient, dedicated and exemplary officers. Their devotion to duty needs to be recognised and honoured, but this is not the way of doing so. There is a vast difference between gallantry awards and awards for distinguished service. A large number of military personnel, especially from the army, lay down their lives or lose limbs fighting terrorists in various parts of the country, nearly on a daily basis…. 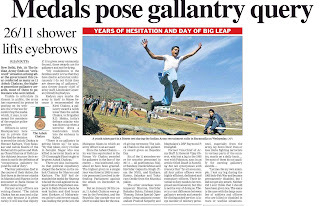 Yet most of them do not qualify for earning gallantry awards…. 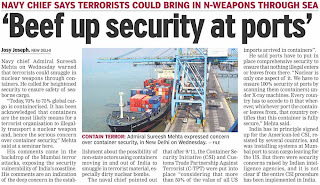 In the backdrop of the Mumbai attacks having exposed the vulnerability of Indian coastline, Navy Chief Admiral Sureesh Mehta today said cargo containers could be used to transport nuclear weapons. "Today, 70-75 global cargo is containerised. It is acknowledged that the container is the most likely means for terrorist organisations to illegally transport a nuclear weapon and, hence, there is a serious concern about container security," he said while inaugurating a seminar organised by the National Maritime Foundation here. He said entry of nuclear weapons through containers was only one aspect of the concern of security agencies and these should be scanned thoroughly to ensure 100 per cent security. "Nuclear is only one aspect of it. 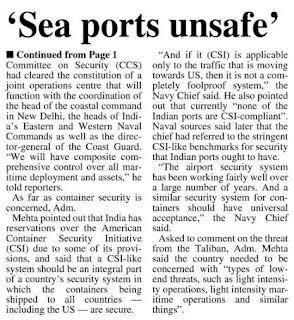 We have to ensure 100 per cent security at ports by scanning them (containers) under X-ray machines. Every country has to accede to it that wherever, whichever port the container leaves from, that country certifies that this container is fully secure," Mehta said. He said maritime regions were less regulated as compared to traffic on land. New Delhi: As international concern is growing over Pakistan signing a deal with the Taliban leaders in the restive NWFP, US has said it will seek a fuller explanation from Islamabad on the issue. The US has also increased its troop count in the border with Afghanistan. The statement suggests the US differs with its own allies Britain and NATO, both have warned that the deal will create safe havens for terrorists and encourage further violence by the Taliban. Hillary Clinton's remarks did nothing to clear the air. "The decision that was announced by the government of Pakistan has to be thoroughly understood and we are in the process of pursuing that at this time,” said Clinton. In Swat and Mingora, pro-Taliban groups celebrated the government bowing to their demand for Islamic Sharia law in the tribal region. There's no sign though of Sufi Mohammad being able to fulfill his part of the deal to get the Taliban including his son-in-law Mullah Fazlullah to lay down arms. 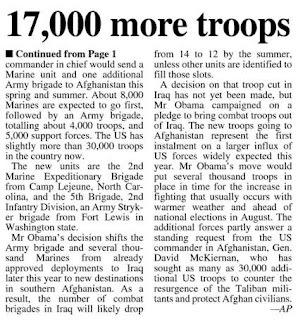 Meanwhile, US President Barack Obama has approved the deployment of 17,000 more US troops in neighbouring Afghanistan. 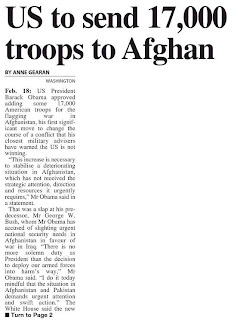 “I’m in the process of a strategic review of our approach in Afghanistan,” Obama said. Obama also underscored his concern over the Taliban insurgency in Pakistan but did not indicate whether he supported the peace deal with the Taliban or whether he was even consulted on it. Analysts believe Islamabad is readying its trump cards ahead of Pakistan Army Chief General Kayani's visit to Washington on Sunday. Kayani may bargain for better terms and financial assistance to Pakistan and of course military aid. The government today said that the Indian Army was not in possession of any books, documents and miscellaneous items recovered from the premises of the Golden Temple complex during Operation Bluestar. These have been handed over to the Shiromani Gurdwara Parbandhak Committee (SGPC), Amritsar, Curator Museum (Punjab government), Government Treasurer, Amritsar (Punjab), Department of Cultural Affairs, Chandigarh, and also some documents to the CBI, New Delhi. The representative of SGPC had also certified that they had no further claim on the Army or the government. In a written reply in the Rajya Sabha today, the government said the SGPC had approached it with similar requests in the past. The Army did not possess any of the manuscripts/articles recovered from the Golden Temple during Operation Bluestar that was conducted in 1984. Realising that the forthcoming general elections would put their pending demands on hold, the top brass of the armed forces have formed a high-powered committee to seek early resolution of the two remaining pay and status-related issues that have had the troops worried over the past six-eight months. The committee was formed following directions from the Prime Minister’s Office (PMO) in December last to sort out the four-core issues raised by the armed forces after the Sixth Pay Commission was implemented. While two issues had been resolved, the rest remained. As the model code of conduct was impending, the armed forces fear that their two demands needed immediate attention, a senior officer said. One is that grade pay for all ranks of officers to be at par with the their counterparts in the civil services. Presently, the committee of secretaries that was looking into the anomalies of the Sixth Pay Commission had created difference by raising the grade pay of civil service officers. This means the salary of person on civil side, including the police, would be higher and was affecting the entire lot of officers. The other pending issue is putting all lieutenant generals at par with director generals of police. In the previous Fifth Pay Commission, the DGPs were at par with lieutenant generals. Now, the Sixth Pay Commission has bifurcated the lieutenant generals and the equivalent ranks in the Navy and IAF into two. The GOC-in-C, their Naval and IAF equivalents and few other officers at the headquarters are in a grade that is higher than that of the DGPs while other lieutenant generals are in a grade lower than the DGPs. This anomaly is affecting about 150 officers. The Central Intelligence Agency (CIA) has secretly been using an airbase in southwestern Pakistan to launch the Predator drones to attack the militants within the country, a report said. 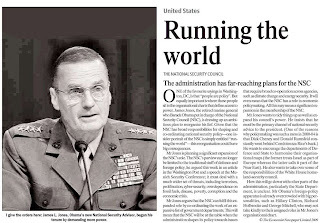 Both Pakistan and US governments have repeatedly denied that Washington is conducting military operations, covert or otherwise, on Pakistani territory. 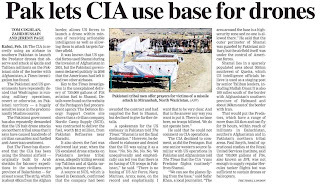 The Times report says that it has discovered that the CIA has been using the Shamsi airfield, 30 miles from the Afghan border, in the southwestern province of Baluchistan for at least a year. The strip allows US forces to launch a Drone within minutes of receiving actionable intelligence as well as allowing them to attack targets further afield, the report said. The report quoted Major General Athar Abbas, chief military spokesman, confirming that US forces were using Shamsi adding that "The airfield is being used only for logistics." "The Americans were also using another airbase near Jacobabad, 300 miles northeast of Karachi, for logistics and military operations", the report quoted Abbas as saying. "We can see the planes flying from the base. The area around the base is a high-security zone and no one is allowed there." Safar Khan, a local journalist in Shamsi said. The key to The Times investigation was the an unexplained delivery of 730,000 gallons of F34 aviation fuel to Shamsi airfield, details of which were found on the Pentagons fuel procurement agency website.